The prospect of creating your very first Christening gown may be quite daunting but if you do not aim to create something too complicated you will find it enjoyable and may want to move on to more complicated gowns. I looked at all the available sewing patterns and found a 1940’s vintage style one which only used three main pieces and appeared very easy to construct. After all if you are going to embroider the gown and want that to be the focus, it doesn’t need to be of a fancy construction. When you have decided which pattern you are going to use you need to get the pattern pieces out so you can plan your embroidery. Measure your pattern pieces to see what will fit. Then you can look at the designs from the collection you are going to use. There are several scroll type designs as shown above in the Une Petit Princesse collection and if you use these along a straight hem you will add a scalloped effect without the work of creating scallops. When developing the collection I created very large embroideries and then divided them up into smaller designs. This is one of my creations, and if you are familiar with the collection you may be able to identify most of the designs. Now this embroidery stitch out measures 300mm by 412mm (12.29″ x 15.78″) and consists of at least 12 designs some of which are duplicated. I will probably prepare a tutorial on creating this embroidery. Let me know if you are interested. Now the front piece of my simple gown is about 21″ by 17″ so this is perfect for it and would look wonderful in gold (Sulky Rayon 1070) so it stood out. The gown has little pleats on the shoulder and the back it has no centre seam which means an equally beautiful embroidery can be stitched there. Always embroider the back as well as the front of any garment as it is seen just as much. A few narrow bands of embroidery at the neckline or along the sleeve edges will balance your Christening gown. 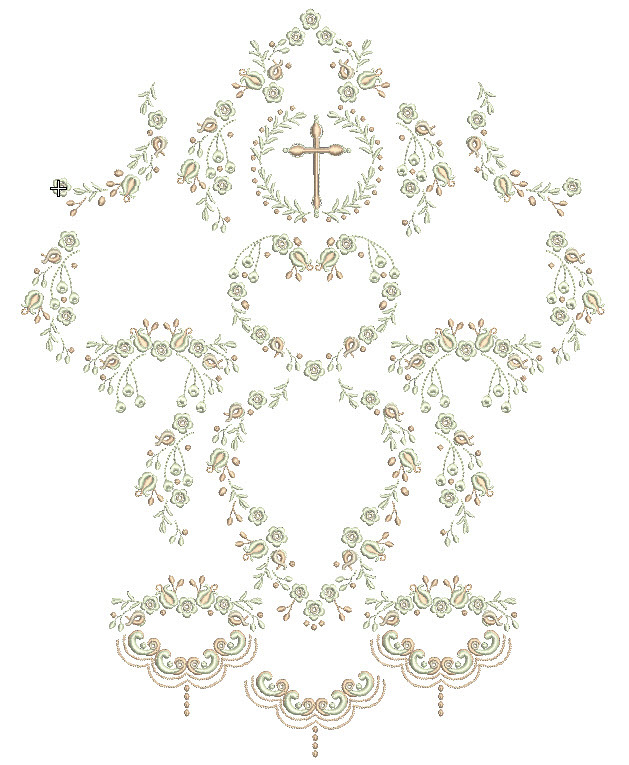 The freebie from this collection and sections of designs from the first set will be suitable for this type of application and I think the embroidery should be done before construction. Perhaps you will find it easier to plan if you print out paper templates of the embroidery which you can lay on the fabric pieces. This close up of GFE-UPP-4-11 which is being released today, shows you how wonderful Sulky Rayon 1070 looks. There are several designs in this new set for 12″ by 8″ hoops that are suitable for the basis of a detailed embroidery on a gown. Just add other smaller designs around the central design. Test this out in your embroidery software. As I was embroidering this out I was thinking how important it is to test your embroidery before you start on a project to find out how thread colours look on your fabric and also to decide which stabiliser gets the best results. Just select a small design or part of a larger one to do your tests. I remove most of my Stitch and Tear from these embroideries and as I press them on the back I can remove any more that appears necessary. 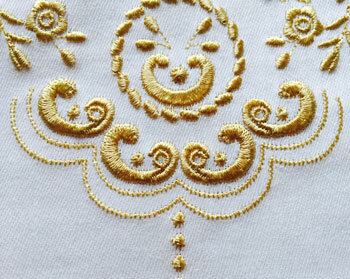 Press your embroidery without steaming first, especially if you are using silk. The first press sets the stitches and is done over a towel on the back, so that the embroidery is not flattened. Check the front before you apply more pressure to get the fabric around the embroidery to lay flat. Snip all the jump stitches on the back. As you can see my machine has failed to cut a few jump threads on the front. These were not noticeable at first, but looking along your fabric will enable you to see them all, especially if you are out doors! Graceful TIP – wash, tumble dry and steam press your fabric before you start the cutting out providing it is washable then you know it is really washable! Une Petit Princesse 4 for 12″ by 8″ hoops will be released later today. 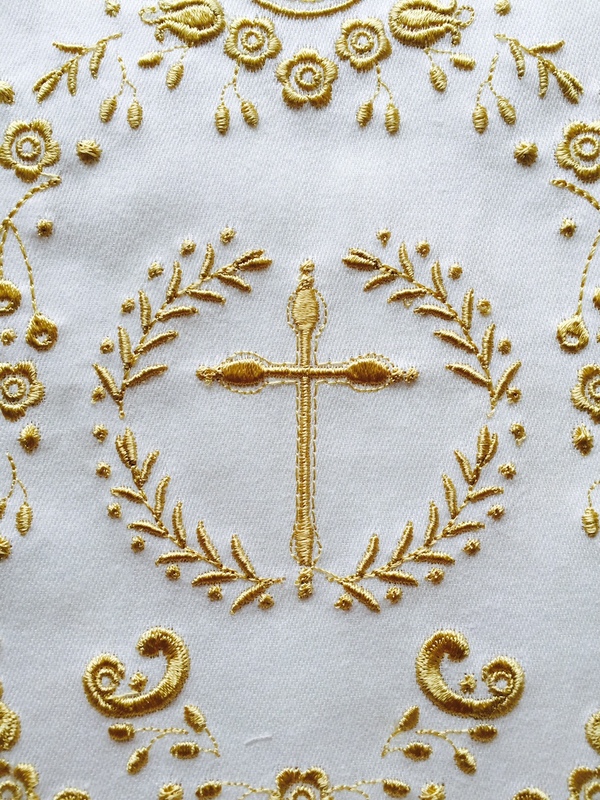 This entry was posted in Discussing machine embroidery, Embroidery projects, New Designs. Bookmark the permalink.